This air freshener isn’t that innocent after all, considering the fact that it comes with a camera and microphone to capture all those illicit moments under the guise of suspicion. A covert 3G colour camera and microphone are discretely built into this common domestic air freshener, allowing the user to receive both crisp picture, and excellent sound from anywhere in the world where there is 3G service. Gone are the days where range is important and you can only see images within a 100m radius, on a good day, now you can see and hear not only from another town or Country but also from another Continent. This is a very special piece of equipment, modified by our own engineers and is ideal for security-related situations where clear, and reliable images and sound are essential without the problems of being in range and maybe spotted by the target. You get approximately 300 hours of battery life in standby, but recording action is limited to just 1.7 hours with fully charged batteries. 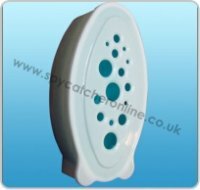 This spy Air Freshener doesn’t come cheap though, retailing for £1,380.63 after taxes.